Ultra-Hybrid. Toshiba presents quite a few interesting Ultrabooks to the world. 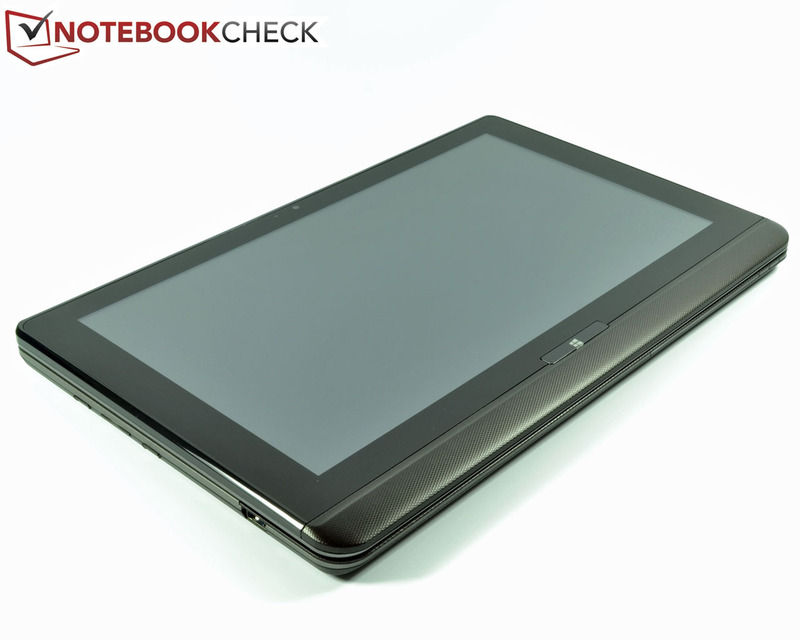 Our latest test model is a fusion of a tablet and Ultrabook. It employs a 12.5-inch touchscreen and a power-saving Intel Core i5-3317U processor with integrated Intel HD Graphics 4000 IGP. The Hybrid model looks great but what does it have to offer on the hardware side? 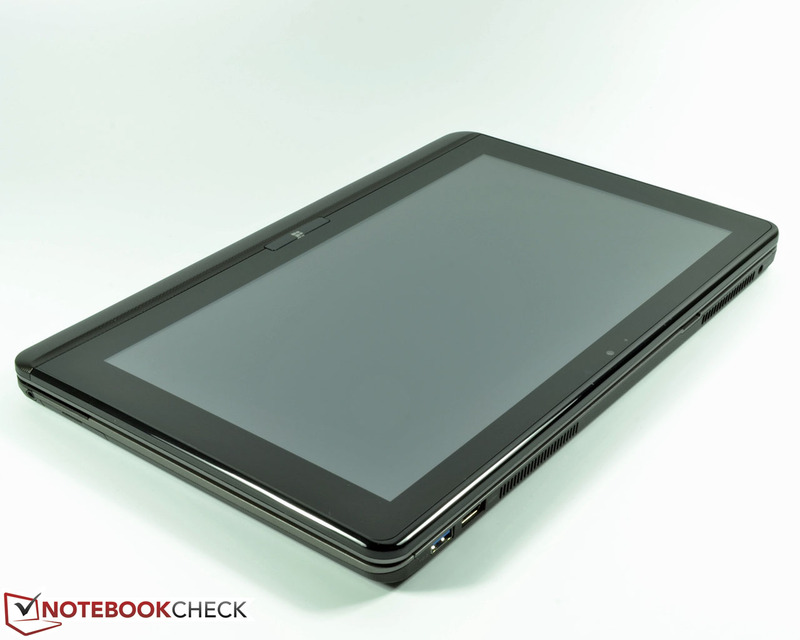 Toshiba is no stranger to the Ultrabook market. In fact, the Tokyo-based manufacturer is often at the forefront of new technologies. In the past, we have been impressed by models such as the Satellite Z930, the business Portégé Z930 and their predecessor, the cheap Satellite U940. 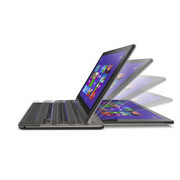 Now Toshiba is riding the Windows 8 "Touch" trend and launching its own hybrid laptops with touchscreens. The Japanese firm introduces the U920t series, which offers three configurations. Our test model, the Satellite U920t-100, is the most expensive model of the series. It is followed by the Satellite U920t-10G with the same CPU and Windows 8 Pro and the Satellite U920t-109 with an Intel i3-3217U CPU. 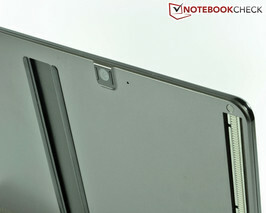 Although the Ultrabook sub-category of convertibles is quite new, it is already filled with many competitors. Dell offers the XPS 12 which uses a 12.5-inch rotatable touchscreen. 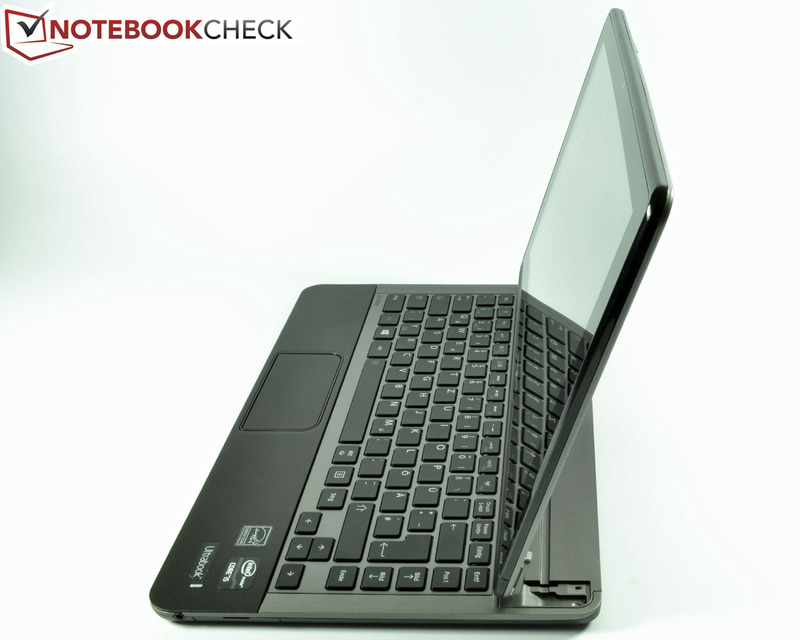 Sony has the 11.6-inch Vaio Duo 11, which uses a slide mechanism (like our test model). 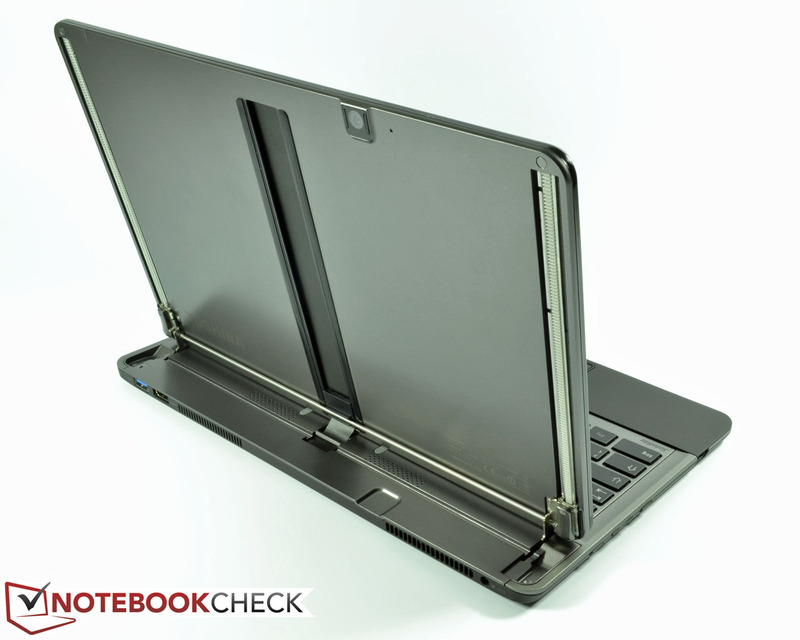 The 13-inch Lenovo IdeaPad Yoga 13 combines the touchscreen with 360 degrees rotatable hinges. The Asus Taichi 21 includes two 11.6-inch screens. Other manufacturers offer a combi solution: tablets which can be docked into optional keyboards. Often, these models use the weaker Intel Atom processors: for example, the 11.6-inch HP Envy x2, Samsung ATIV Smart PC or the two 10.1-inch Acer Iconia W510P and Iconia W510 tablets. 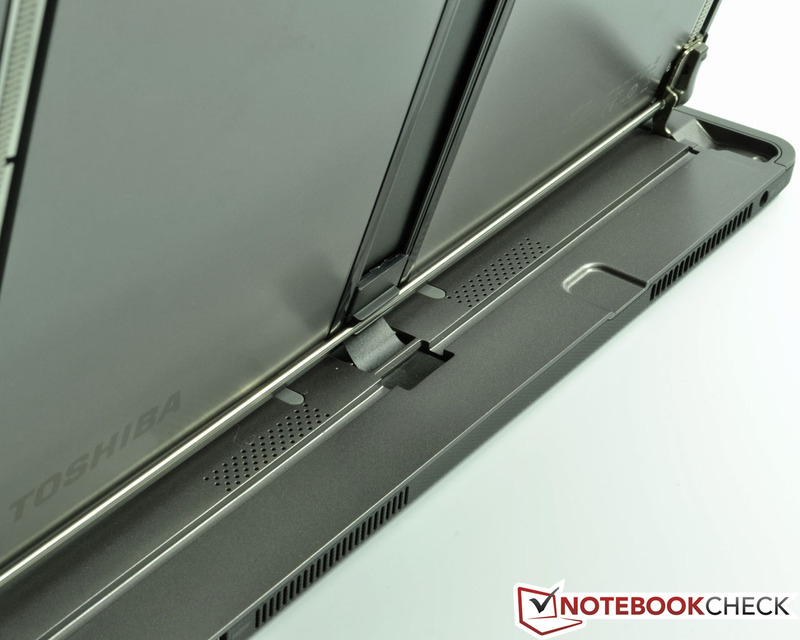 Toshiba has chosen a slider mechanism for the Satellite U920t and picks a power-saving Intel Core i5-3317U CPU with integrated Intel HD Graphics 4000 IGP. 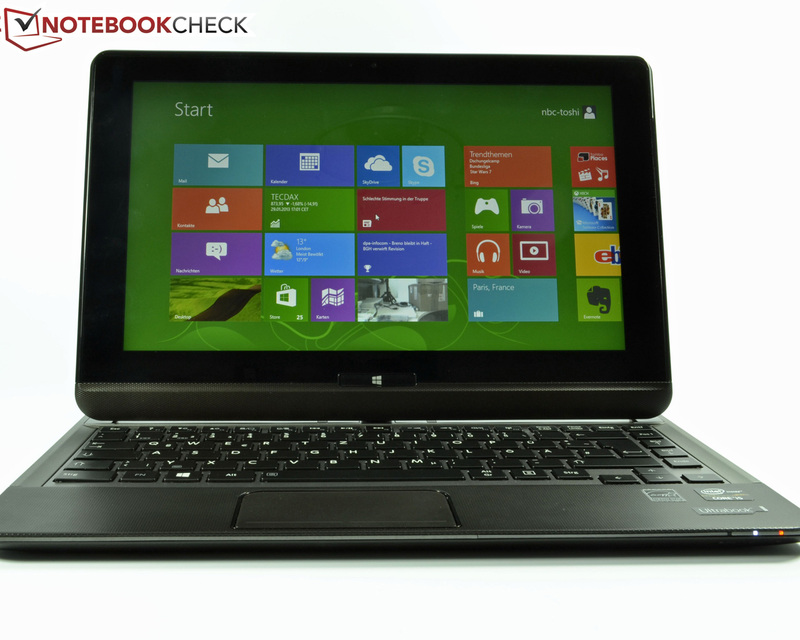 The Satellite U920t-100 is equipped with a full version of Windows 8, which works great on touch-based input. The touchpad and keyboard are available as alternative input devices. In the following in-depth review, we will put the new Toshiba convertible to the test and find out what it has to offer. 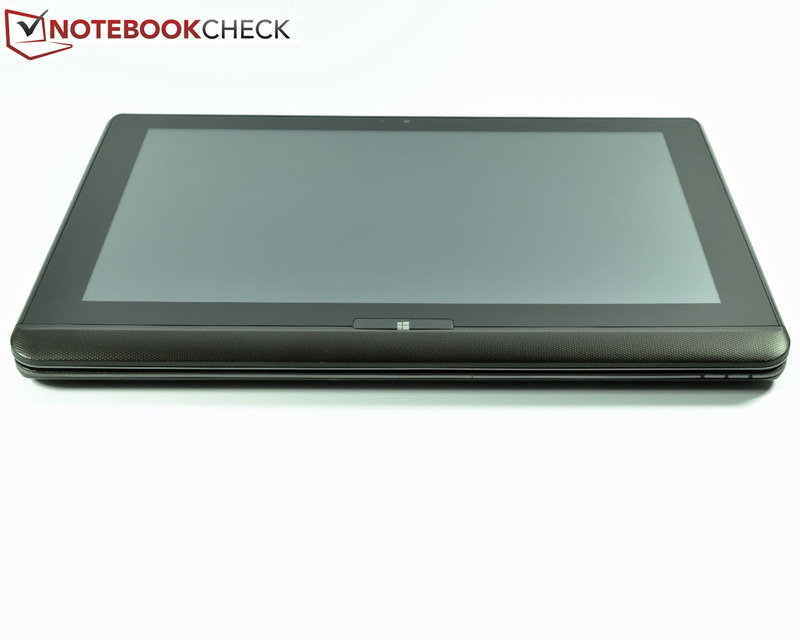 TThe Toshiba Satellite U920t-100 looks like a somewhat thick 12.5-inch tablet in the closed state. 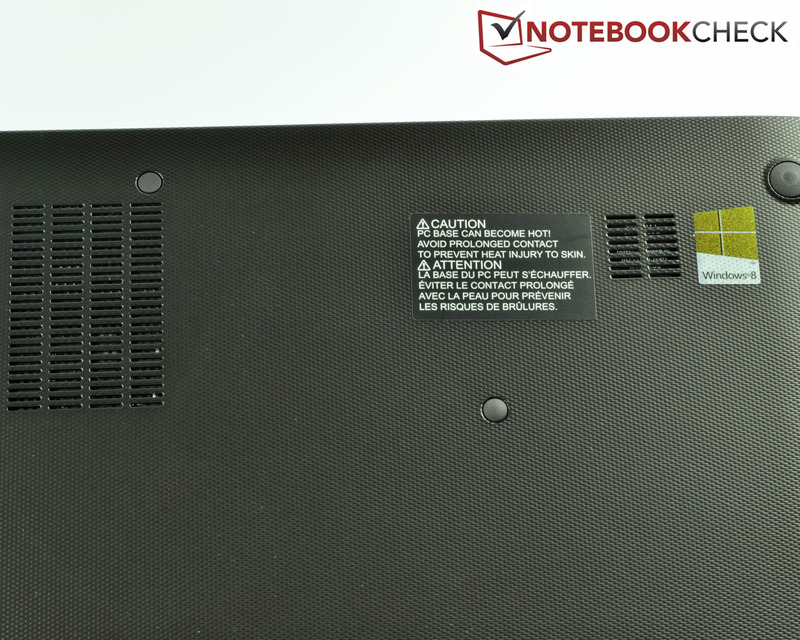 The 20 mm (~0.79 inch) thickness of our test model is 2 mm (~0.08 inches) thicker than the Sony Vaio Duo 11 but lies slightly below the Dell XPS 12 Convertible (23 mm/~0.91 inches). 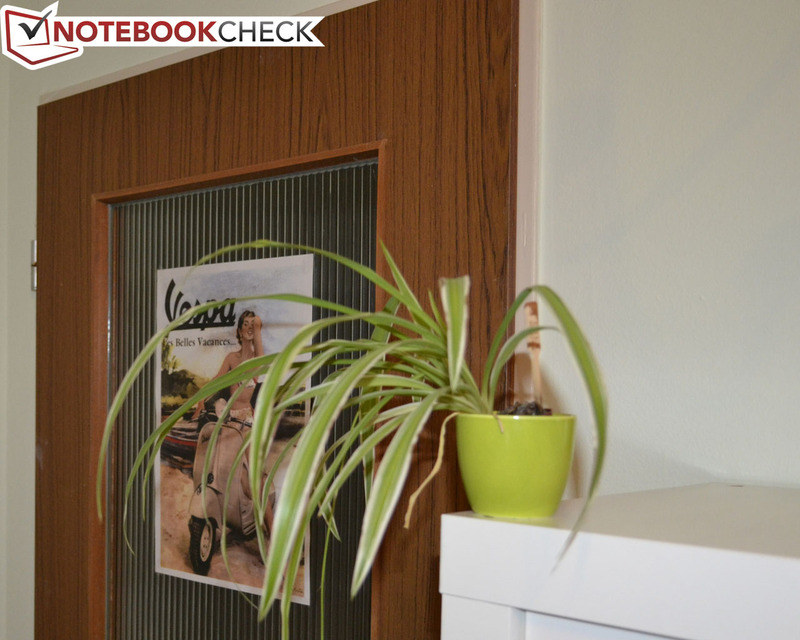 The measurements do not say much as all three models are easy to handle. Still, the Toshiba Satellite U920t-100 (1.5 kg/~3.3 pounds) weighs significantly more than the Sony Vaio Duo 11, but once again, it falls short of the 12.5-inch Dell XPS 12. All-in-all, the closed Satellite U920t-100 does not seem heavy. The two-color side view and rounded corners slim the hybrid down and give it a nice appeal. Once the device is opened from tablet mode, the user finds a small hand-rest region made of synthetic material which contains a small touchpad. The backlit keyboard is placed above in an anthracite-colored base made of synthetic material. The keyboard gives way under pressure, especially near the middle and the display cover also has similar issues. The bottom of the hybrid is made of rubber synthetic material which offers a good grip, which is useful when using the device in tablet mode. The rubber feet grant the device a good grip on the table while in notebook mode. The bottom is also susceptible to pressure, especially near the ventilation opening or the SD card slot. The manufacturer promises that the slide mechanism is reliable and long-lasting. We can confirm this assertion from our test, but the model cannot claim to have the sturdiness of a unibody case. Still, the seemingly fragile slide construction from Toshiba proves to be robust. Although the slide mechanism is well-designed, the display hinges are disadvantaged. The display barely moves when one taps lightly against the glass surface, but when opening or moving the device, the display wobbles significantly. This can cause distracting reflections on the bus, train or plane, which will be strengthened by the reflective nature of the Corning Gorilla glass. With the exception of the above flaw, the workmanship is flawless, as the even gaps in the material attest. Maintenance by the user is possible but Toshiba has not included a maintenance flap to this end. So, to access the innards of the device, the user will have to first remove a few screws below the rubber feet of the device and then lift off the entire bottom panel. 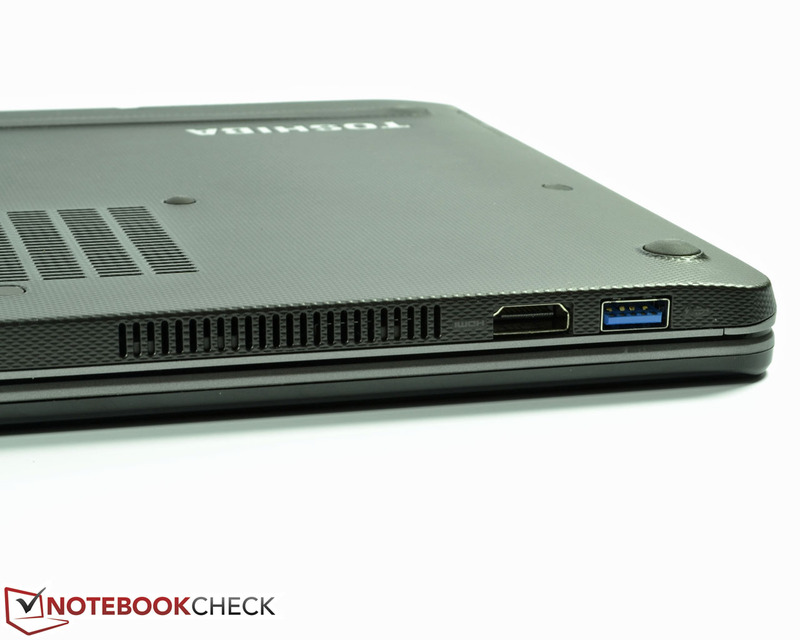 Most Ultrabooks offer little diversity in this area. The Sony Vaio Duo 11 is an exception to the rule with its full-size Ethernet and VGA interfaces, but our Toshiba test model follows the Ultrabook masses. 2x USB 3.0, one with Sleep-and-charge functionality, a full-sized HDMI interface, a 3.5 mm audio jack and a power outlet can be found on our test model. Toshiba has also placed an SD card reader (up to 2 TB) on the Satellite U920t-100 under a rubber flap. Sadly, that is the extent of the connectivity of our test model. One USB 3.0 port and the HDMI interface are placed on the back of the device so as to minimize the cable salad while in notebook mode. The gap between the two interfaces should have been a bit larger as a thick connector can block the adjacent port. The left case edge houses some typical controls for tablets: the power button, a volume rocker and a lock key for the automatic display rotation. The pressure point and stroke distance of these controls is perfect. Toshiba has given the Satellite U920t-100 a WLAN-b/g/n module and Bluetooth 4.0. These are the most important wireless modules. UMTS or LTE are not available. A Gigabit Ethernet interface is also missing. However, Toshiba includes Intel Wireless-Display technology for wireless transmission to compatible devices. In our test, the wireless modules worked flawlessly. The WLAN module set itself apart with its amazing reception, even when the router was at the other end of a large house (about 10 meters/~33 feet away) and the signal had to come through 3 walls. In comparison, the iPhone 5 or MacBook Air 13 could not offer such a stable connection. The slim packaging contains the device, a 259 g (~0.59 pound) power adapter and a short manual. Additional accessories can be bought directly from Toshiba or a third-party manufacturer. Three accessories are prominently advertised on the inside of the packaging: the Dynadock U3.0 - a universal docking station with integrated Dual-Screen-HD graphics card (maximum resolution: 2048x1152 pixels) and various ports, such as the USB 3.0, DVI-I, HDMI or Gigabit-LAN. The docking station is available starting at 179 Euros (~$240). In addition, the Stor.e Slim, a USB 3.0 2.5-inch HDD with 250 GB capacity and the External Supermulti Drive, a portable DVD burner for 59 Euros (~$79), are also featured on pictures on the packaging. As mentioned before, the user will not find it easy to access the innards of the device. 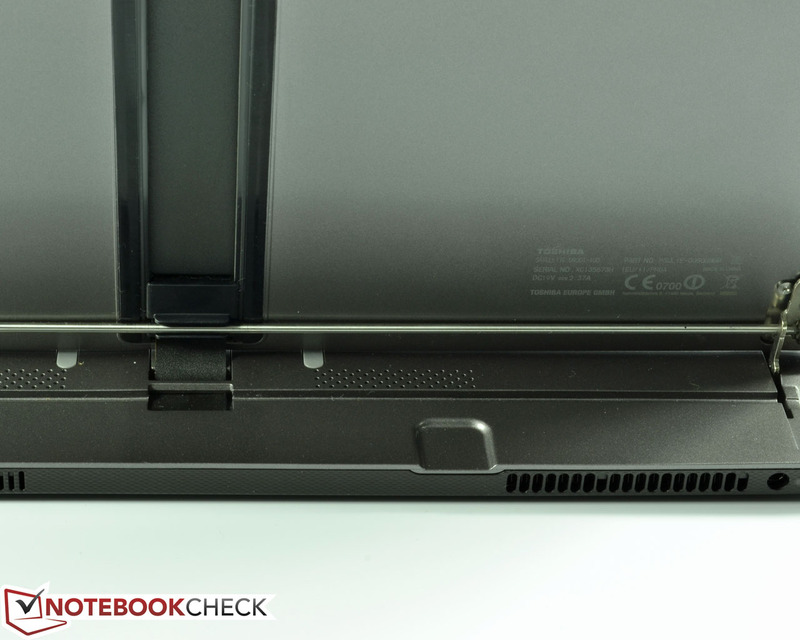 The bottom flap of the laptop can only be removed after taking out 10 rubber feet and the screws beneath each one. Upgrades are only possible in the RAM section: the installed 4 GB can be upgraded to a maximum of 8 GB thanks to the free slot. Toshiba offers a 24-month "Bring-In" manufacturer's warranty for the Satellite U920t-100. The service includes "On-site" pick-up service. The guarantee can be extended to 3 or 4 years for 64 or 109 Euros (~$86 or $146 respectively). These and more options are detailed on the Toshiba homepage. The ALC2802-CG Realtek speakers in the Toshiba Satellite U920t-100 are seated on the front edge of the base unit and point downwards. Due to the deflection of the output off the table, the sound seems fuller. Without this helpful boost, the output is weak, as is clear when using the device in tablet mode. The volume is sufficient for decent background sound. However, the user should not set the volume too high as the device then tends to distort the output. The pre-installed "SRS Premium Sound 3D" equalizer offers some customization options, but, in general, the output still lacks middle notes and bass and the drowned-out high notes sound too sharp. The audio playback via the 3.5 mm audio jack (with a good quality output device) is good. The maximum volume is high and is accompanied by a constant, audible background distortion. Thankfully, the distortion is not noticeable once something is playing. Toshiba has put two cameras on the Satellite U920t. The front camera is a 1 MP webcam which uses the light sensor but can only produce very distorted pictures with exaggerated colors. This makes the front webcam only suitable for video chats, such as with Skype. The main camera has a resolution of 3.1 MP and auto-focus. A few contrast and brightness configuration options do not turn the convertible into a snapshot camera. 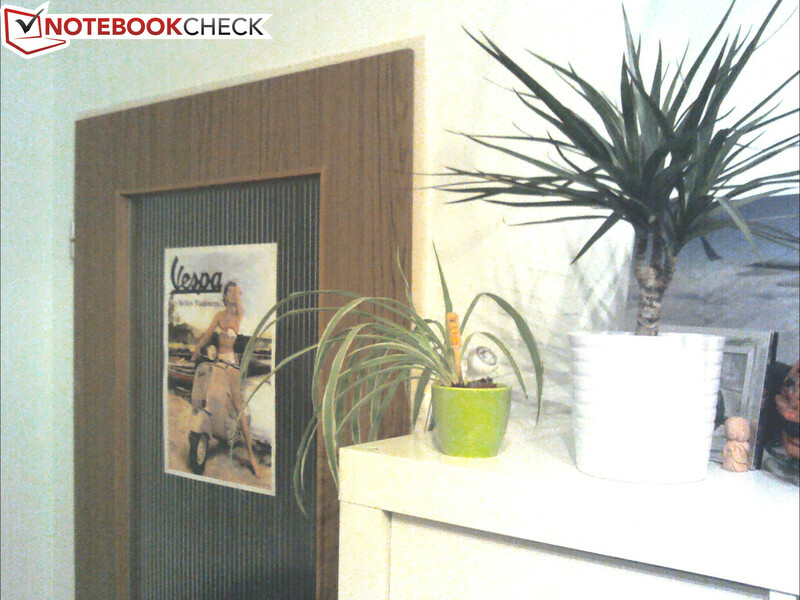 Indoors, we recommend taking snapshot only with good lighting so as to get reasonably good pictures. Outdoors, the reflective touchscreen prevents the user from taking any pictures. In general, pictures suffer from distortion, blurring and slightly warped colors. 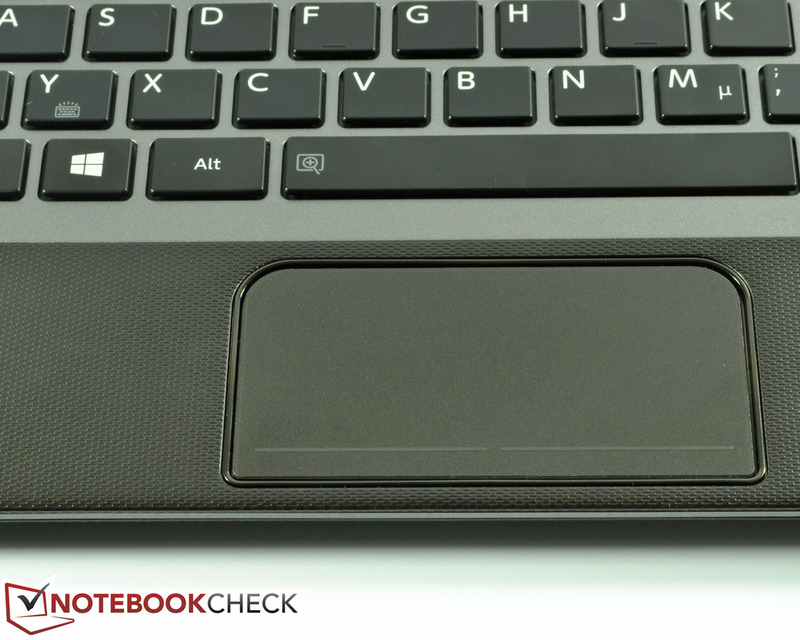 The Toshiba Satellite U920t-100 uses an isolation build for its keyboard: the keys are separated from each other. 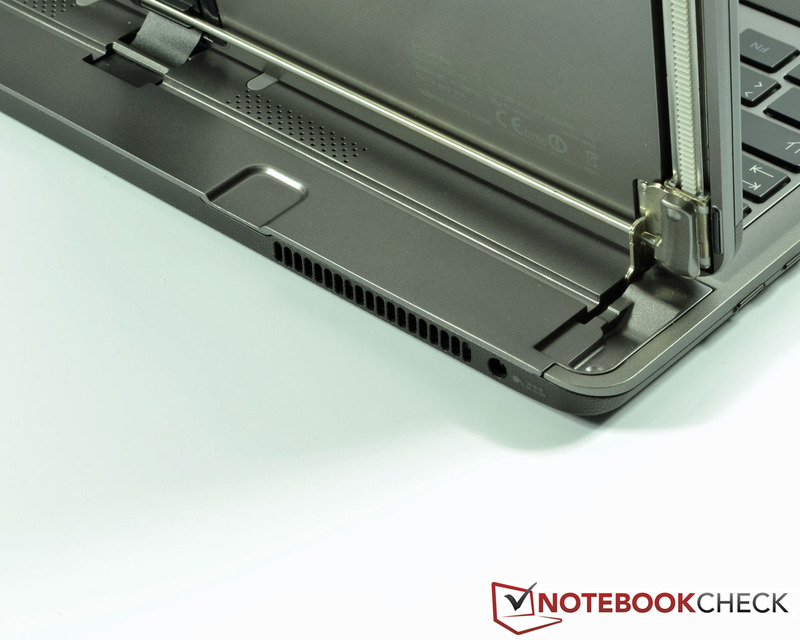 As the slide mechanism takes up one-fourth of the base of the unit, the touchpad and keyboard are left with the rest. This results in a rather small 85 x 45 mm (~3.35 x 1.77 inches) touchpad (hard to use) with integrated mouse replacement keys and a crowded keyboard. The keys have a nice, soft surface and are 13 mm (~0.51 inches) high and 15 mm (~0.59 inches) wide - slightly smaller than the notebook norm. The 3 mm (~0.12 inch) spacing ensures accurate typing. The keyboard leaves enough room for the user to pick up the device without accidentally typing. The input concept is based on the keyboard and touchscreen, which makes the multi-touch touchpad with a spongy pressure point less important. 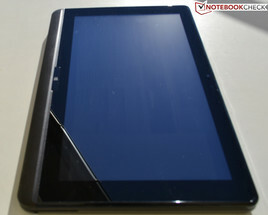 Maybe, Toshiba should have altogether sacrificed the touchpad, like Sony did in the Vaio Duo 11. However, the fact that the keyboard bends inwards under strong impacts is more important as this affects the user's typing accuracy. Despite the fact that the keyboard is nigh silent, seasoned typists will not be satisfied with Toshiba's input design. Thankfully, Toshiba gives the Satellite U920t-100 backlight which kicks in automatically when a key is pressed and turns off after 13 seconds to save on battery. An Fn combination allows the user to turn the lighting on/off. Keyboard and touchpad take up three-fourths of the base. A precise and quick touchscreen. The intuitive interface of Windows 8 requires a touchscreen which can translate input precisely. 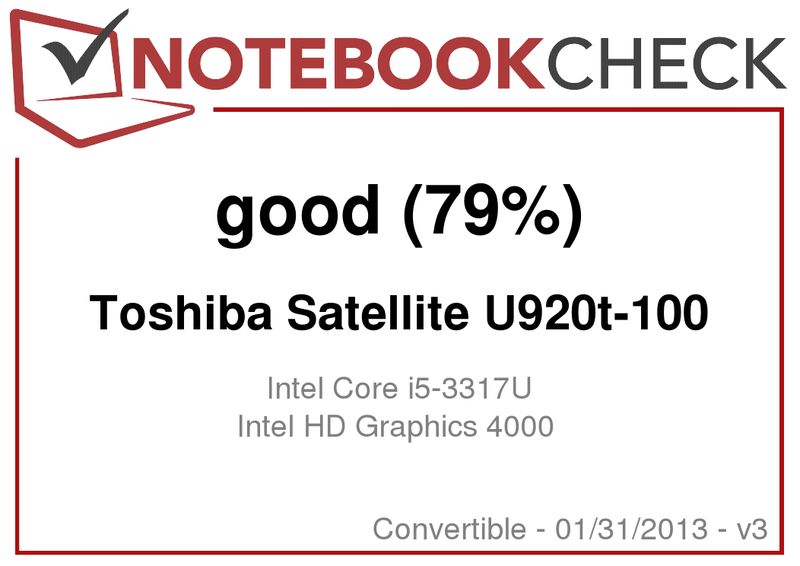 The Toshiba Satellite U920t-100 fulfills this condition well. Motions and tapping of tabs are quickly and accurately recognized. The standard gyro sensor for tablets works well in tablet mode, but in notebooks mode, problems appear. Like in the Sony Vaio Duo 11, if the device is vertical and turned horizontal, the sensor hangs and the user will not be able to get out of portrait mode until s/he puts the device in tablet mode to make the sensor work "properly" again. Toshiba has installed a capacitive, 12.5-inch display in the Satellite U920t-100: the "HD TFT Bright-Touch-Display". The panel has LED backlight and a 16:9 format. The resolution measures 1366x768 pixels and the pixel density is 125.4 PPI. The panel is protected by a scratch-proof layer of Corning Gorilla glass. 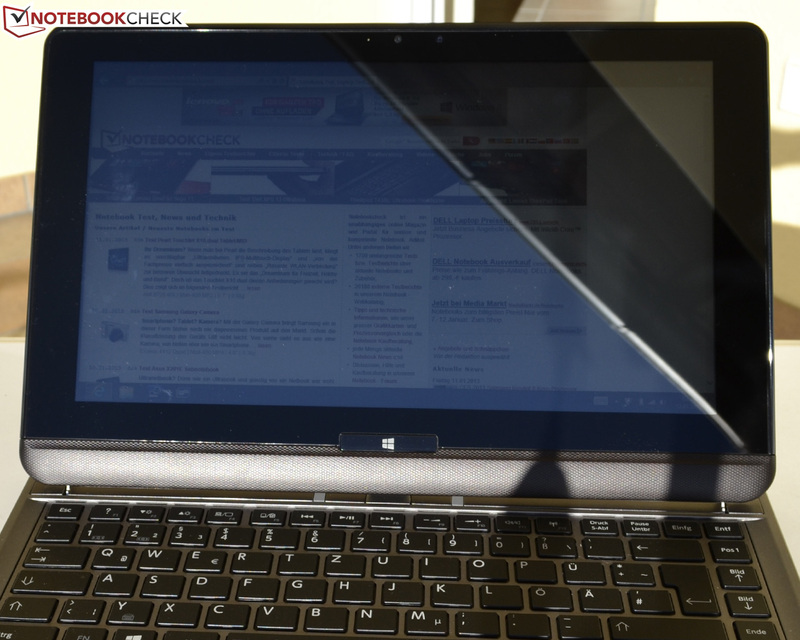 This makes the surface of the device reflect very strongly outdoors in the sunlight. However, most manufacturers accept this drawback as the majority of the competition also chooses a reflective glass surface for their devices. The positive side-effect is that the brilliant colors and picture content are further strengthened. The HD-ready panel is the only option for the Toshiba Satellite U920t, but a higher resolution would not have hurt the 12.5-inch model. 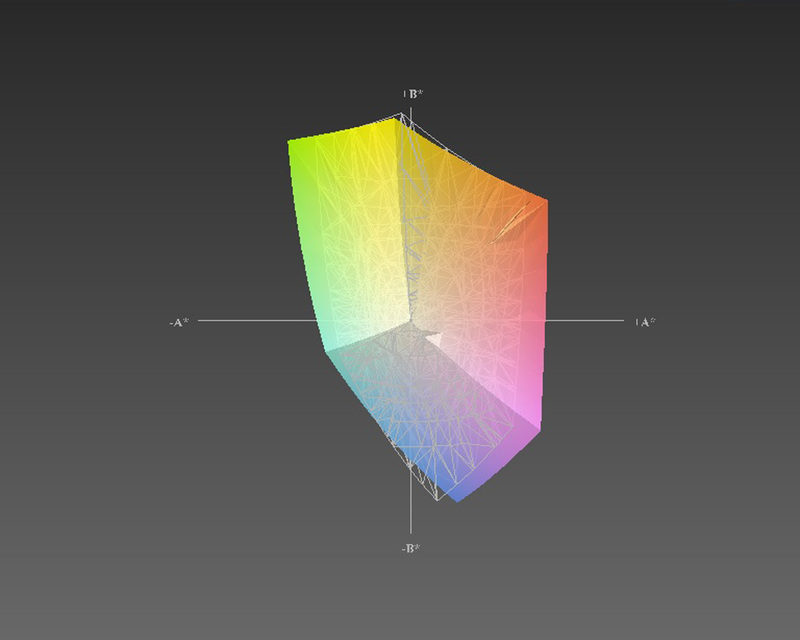 The maximum brightness of 284 cd/m² (X-rite i1 Pro 2 sensor) can be found right in the middle of the display. The average brightness is 262.8 cd/m² and the 85% illumination is decent. However, it drops significantly near the upper edge of the screen: a brightness of 242 cd/m² translates to a 15% lower illumination. On battery, the maximum brightness drops to a disappointing 126 cd/m². The competition performs far better in this category. The FullHD display of the Dell XPS 12 (same size) has 176 PPI and an average brightness of 342.3 cd/m² (max brightness: 355 cd/m²). Sony's Vaio Duo 11 offers 189 PPI and a maximum brightness of 417 cd/m² with its 11.6-inch FullHD display (average brightness: 382.4 cd/m²). On battery, even the Sony Vaio Duo 11 lets it brightness fall to 182 cd/m² but this still lies well above our Toshiba test model. 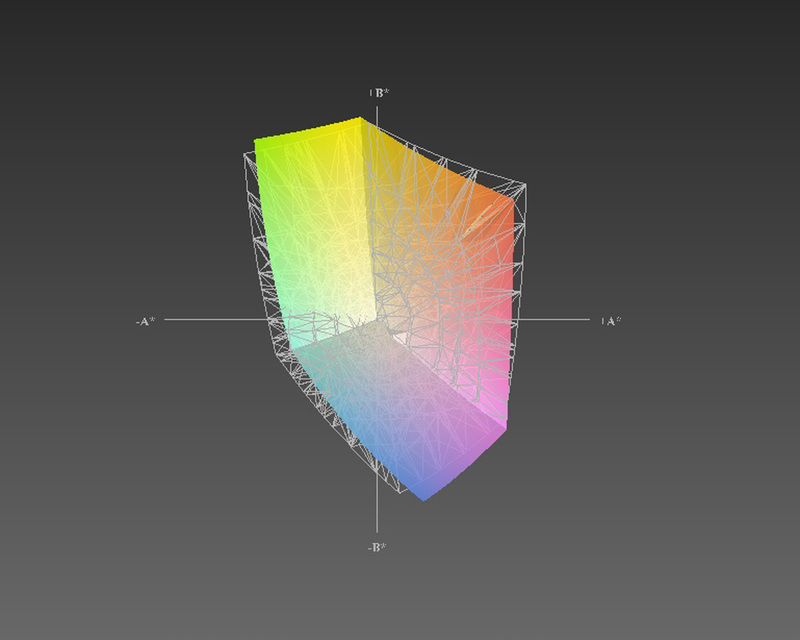 The display has a black value of 0.36 cd/m² and a great contrast of 788:1. This gives the content strong contrast and bright colors. Dark scenes look great and have lots of details. Despite the small screen size, games and movies will look great on the convertible. 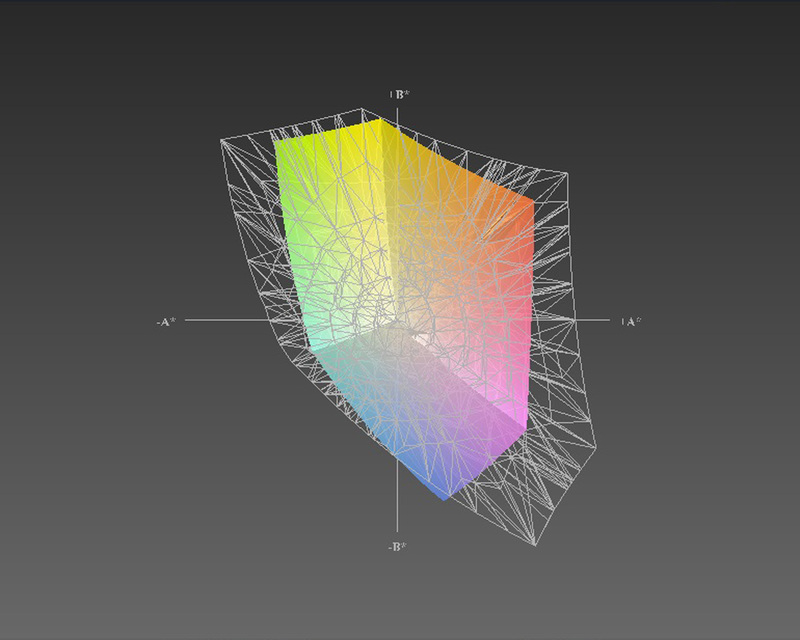 The displayed color space measures a mere 45% of the AdobeRGB color spectrum and covers about 66% of the sRGB reference color space. This means that the convertible is not suited for professional graphics editors. In comparison to the competition, the Satellite U920t-100 is a little better than the Dell XPS 12, but falls short of the Sony Vaio Duo 11. Due to the reflective surface of the display, the limited 126 cd/m² brightness on battery is not enough to make the content clearly recognizable. In fact, the display appears to be too dark indoors. Thus, outdoors, the content is barely legible. In direct sunlight, it becomes impossible to see anything. The display has great viewing angles. A deviation of 30° or more from the ideal position will cause the brightness to fall slowly. Thankfully, color does not invert. 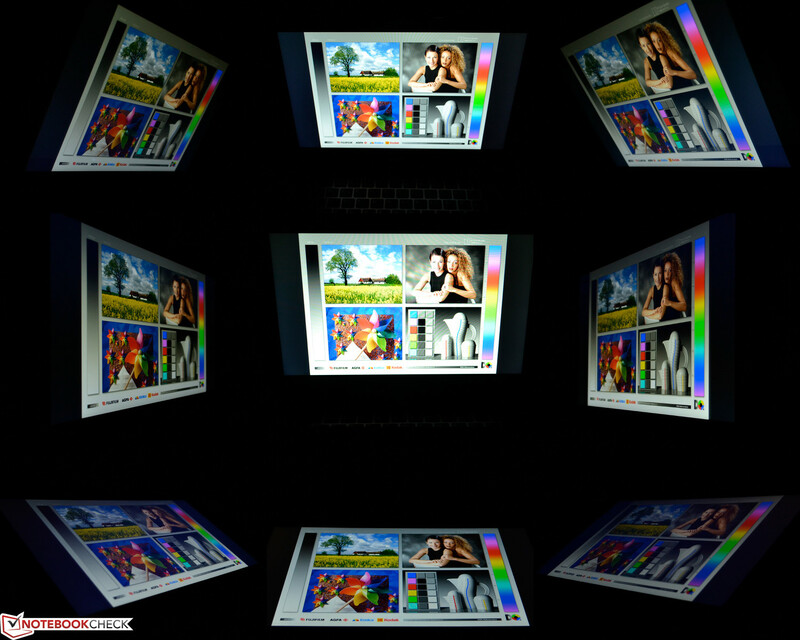 The display will depict content well whether in tablet or in notebook mode, even if it is not held optimally. 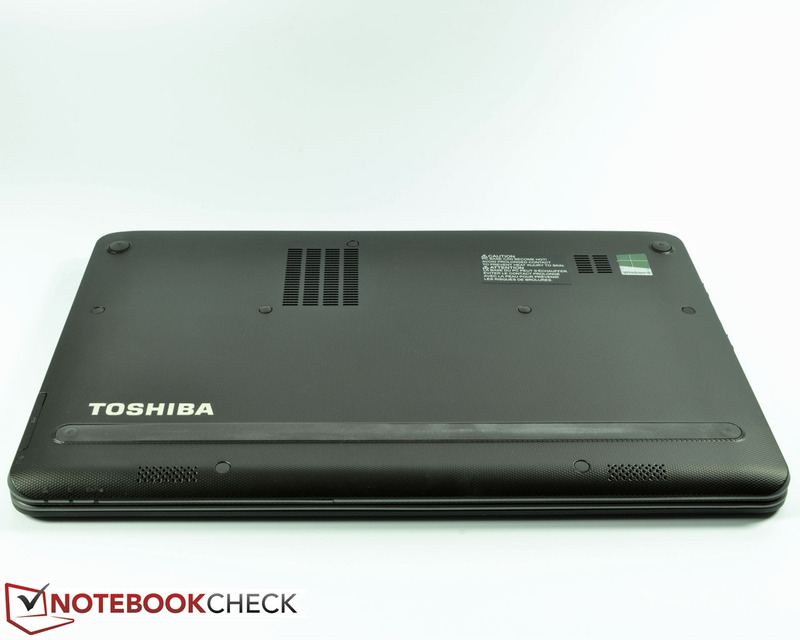 The Toshiba Satellite U920t-100 is powered by an ULV processor (Ultra Low Voltage) Intel Core i5-3317U which contains two cores and has a TDP (Thermal Design Power = Thermal Power loss) value of 17 W. The CPU runs at 1.7 GHz. Thanks to Turbo Boost, the processor can boost this base clock speed up to 2.6 GHz. 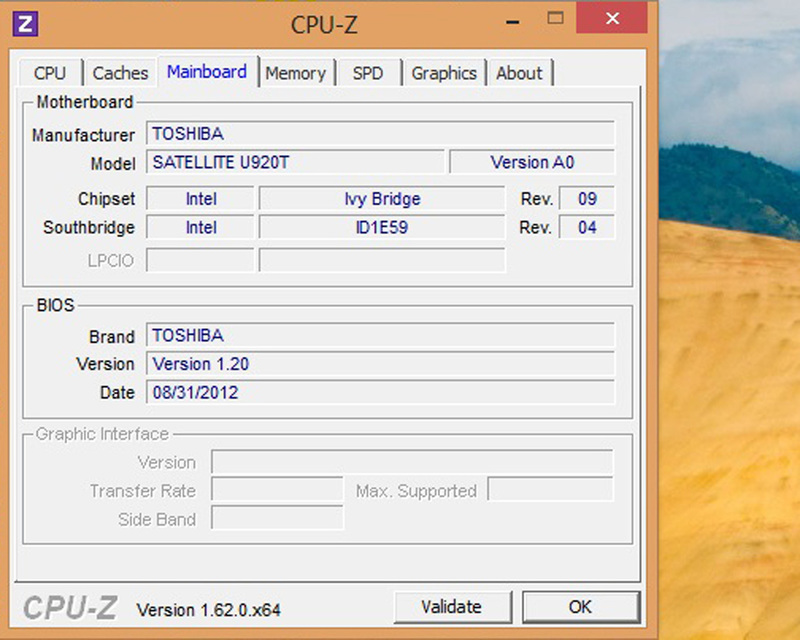 Toshiba offers an alternative for the Satellite U920t: the weaker Intel Core i3-3217U. The rest of the hardware stays the same. The graphics are processed by the Intel HD Graphics 4000 IGP (Integrated Graphics Processor). A dedicated graphics card is not offered in any configuration. 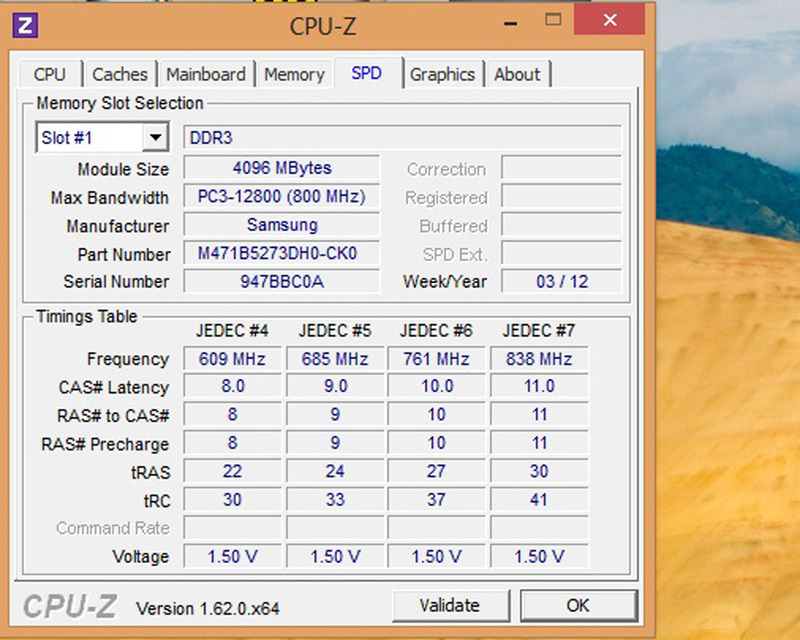 Our test model houses 4 GB DDR3 RAM, which operates at 1,600 MHz. 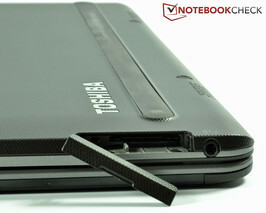 A RAM slot is left free and according to Toshiba, the device can use up to 8 GB RAM. All three models use the same Solid State Disk (128 GB) from Samsung (MZMPC128HBFU). As ULV processors have low temperature emissions and power consumption, they are well-suited for Ultrabooks, which lack the necessary space to accommodate a powerful cooling system or a large battery. 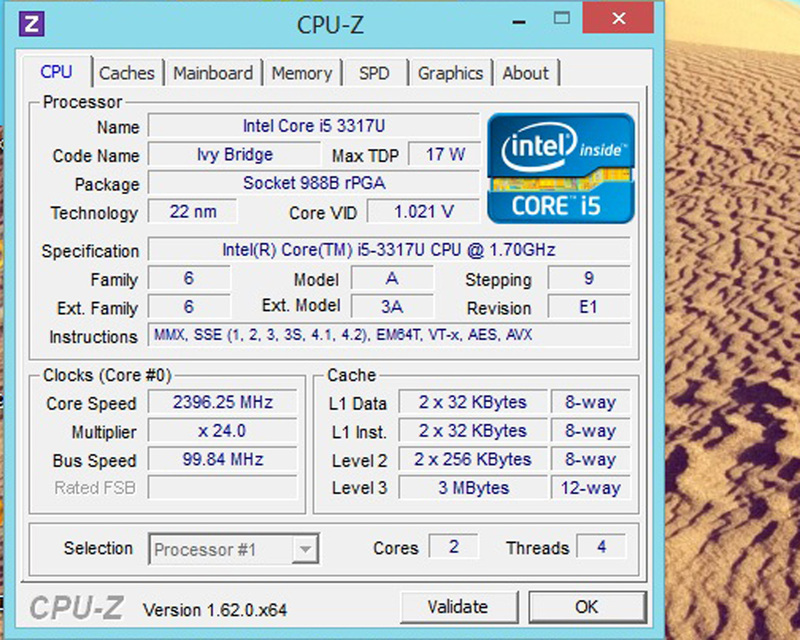 The dual-core Intel Core i5-3317U in our test model still has sufficient performance reserves. Detailed information about this CPU can be found here. We ran various synthetic benchmarks to measure the performance of the CPU. The results lay in the expected region. 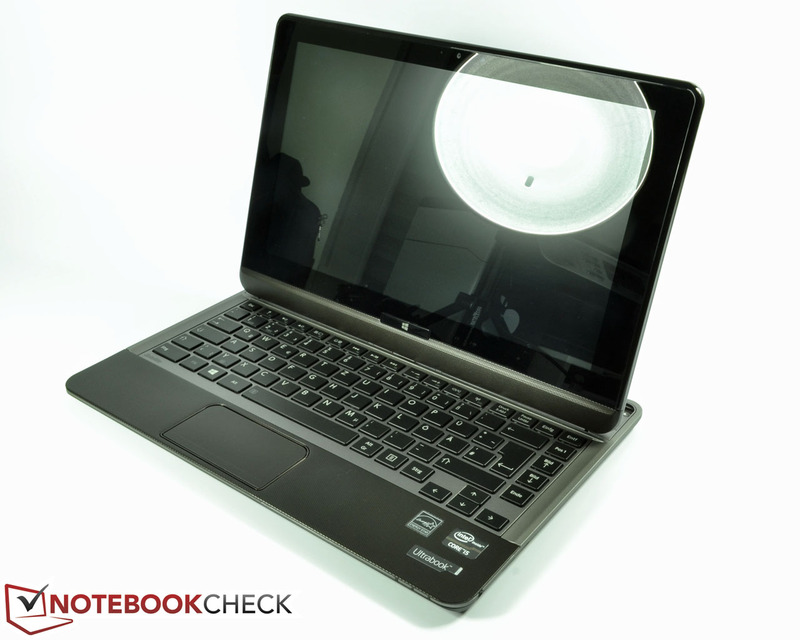 Ultrabooks with similar hardware, like the Asus Zenbook Prime UX31A or the Sony Vaio Duo 11 achieve almost identical scores. In Cinebench R11.5, our test model scores 2.39 points in the CPU Multi 64-bit test, which is close to the 2.35 points achieved by the Sony Vaio Duo 11. Even in the Cinebench R11.5 Single test, our test model scores at the same level as other Ultrabooks with the same CPU (1.06 points). 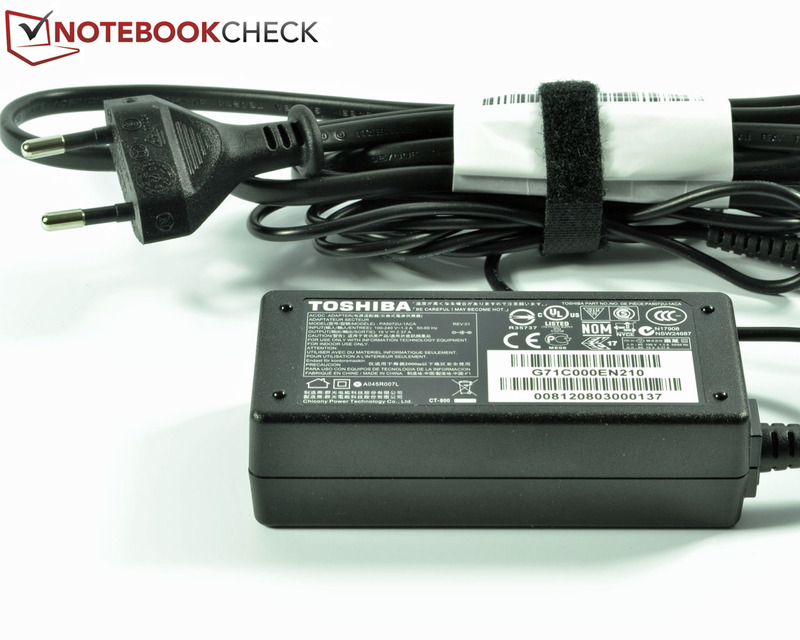 Whether the Toshiba Satellite U920t-100 runs connected to the power socket or on battery, the performance remains identical. The Turbo Boost can be used at any time and there is no throttling of the clock speed. 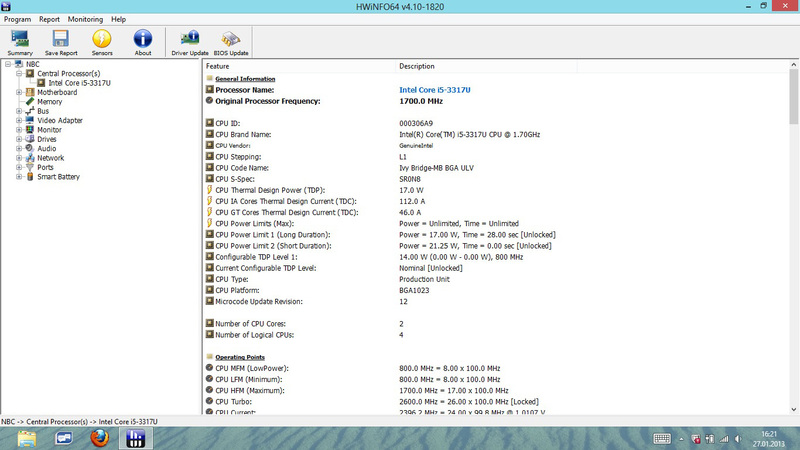 Even on the Toshiba Satellite U920t-100, the PCMark Vantage benchmark seems to have problems with Windows 8. Unfortunately, despite numerous attempts, the test never completed without some complication arising. As such, we could not get reliable results from the benchmark. On the other hand, the PCMark 7 benchmark does not have any compatibility problems and runs without errors. 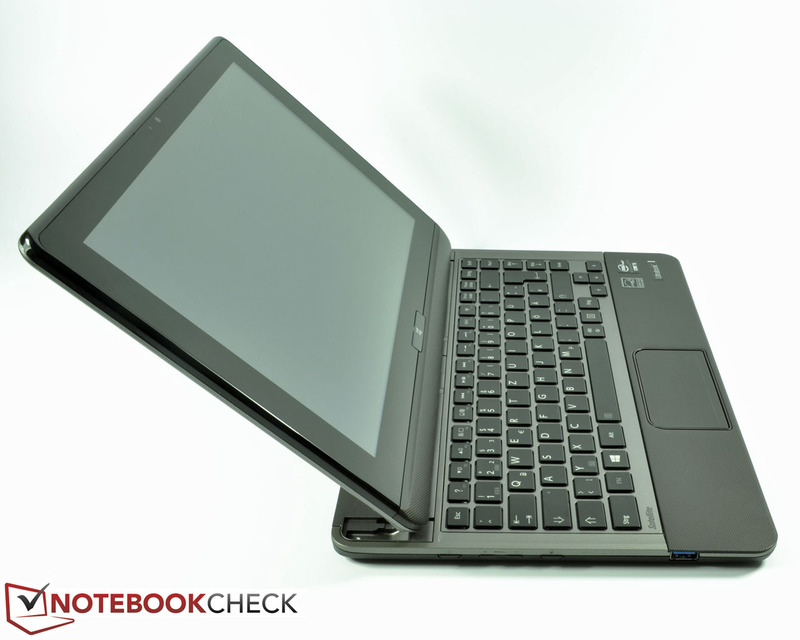 Once again, our test model can hold its own against the Sony Vaio Duo 11. The net result of 4,443 points shows that the system performance is at the expected level. The convertible thanks the fast SSD for these good values. In everyday use, the system performance is truly exciting. 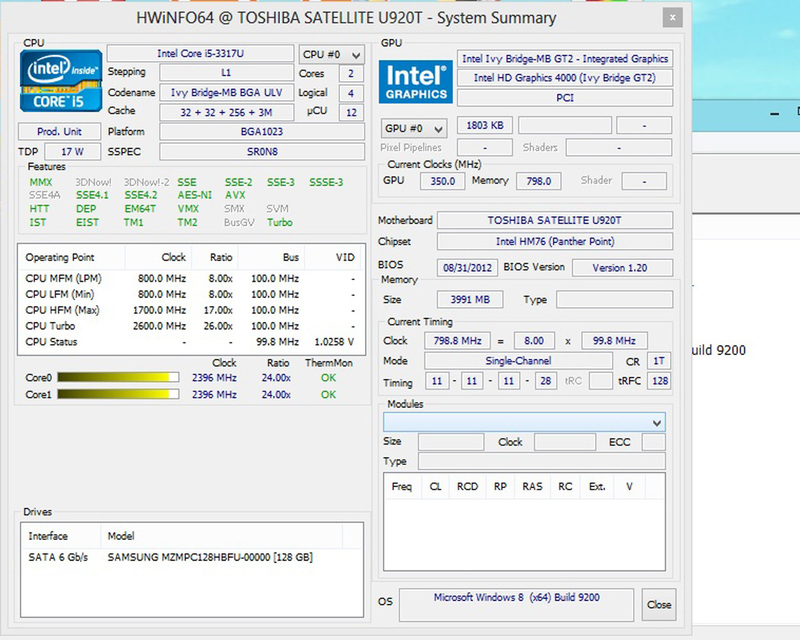 The Satellite U920t-100 employs a 128 GB Samsung SSD (MZMPC128HBFU) connected with a SATA III header (6 GB/s). A fresh system has 123 GB net storage space to offer. 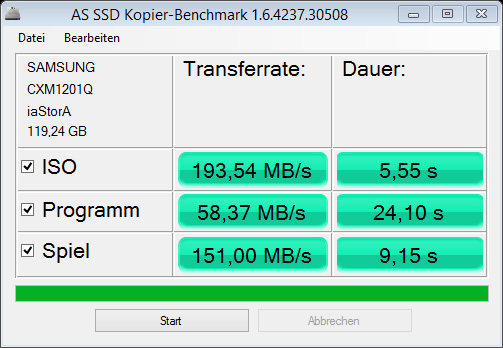 As expected, the Samsung SSD delivers high performance. In the AS SSD benchmark, the test model achieves a read speed of 480 MB/s and write speed of over 250 MB/s. The short access times of the SSD are also impressive. 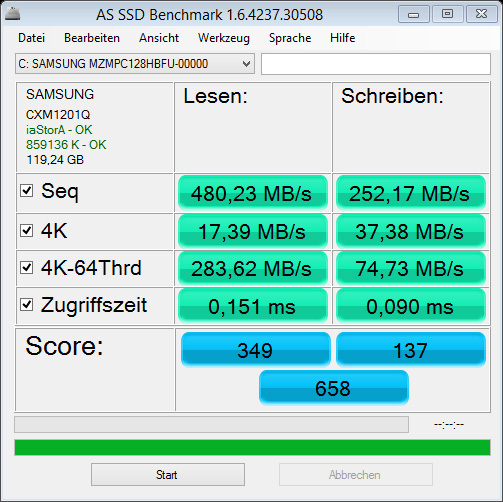 In the 4k values, the AS SSD benchmarks show that our test model and the Sony Vaio Duo 11 perform almost identically (4K read: 17.39 MB/s vs. 17.91 MB/s, 4K write: 37.88 MB/s vs. 37.61 MB/s). The Dell XPS 12 operates around 2 MB/s slower. 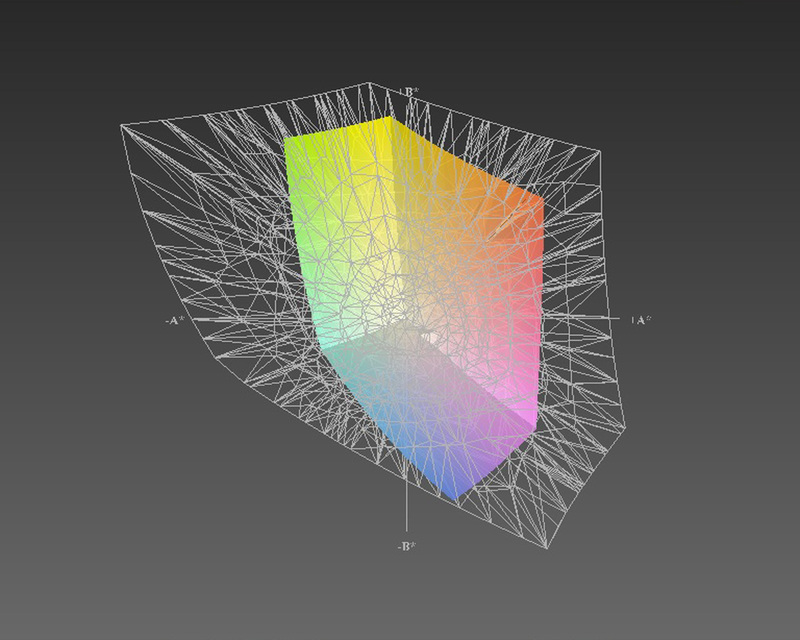 In CrystalDiskMark 3.0, we see a difference. Although the U920t-100 can beat the Sony Vaio Duo 11 and Dell XPS 12 in the read and write tests, the results are even in the 4K test. Overall, the performance is about equal in this benchmark. 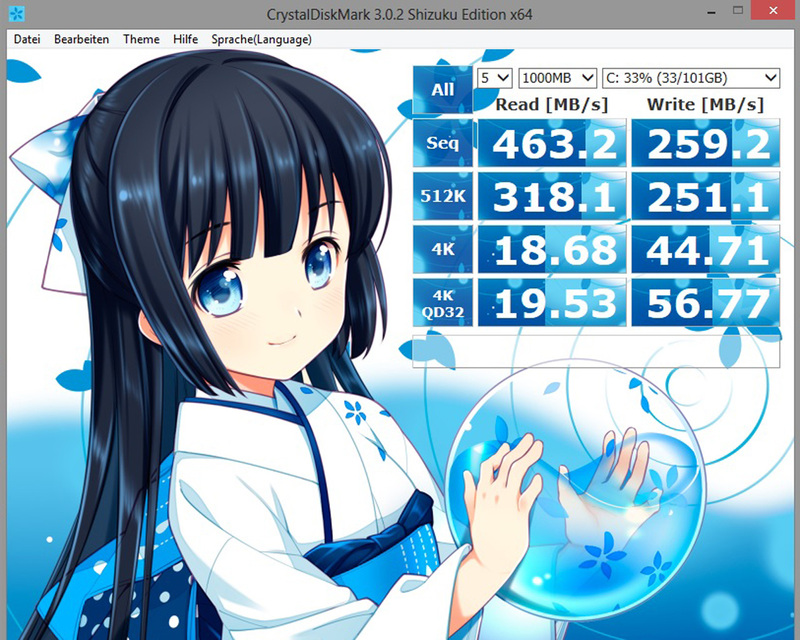 Our extensive benchmark list can provide further information about SSDs. 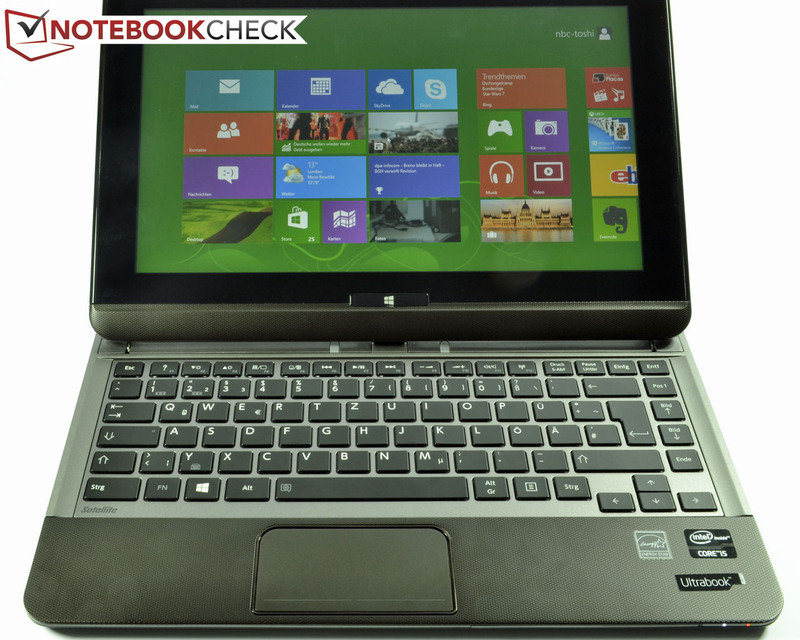 The Toshiba Satellite U920t-100 uses the Intel HD Graphics 4000 IGP for graphics processing. 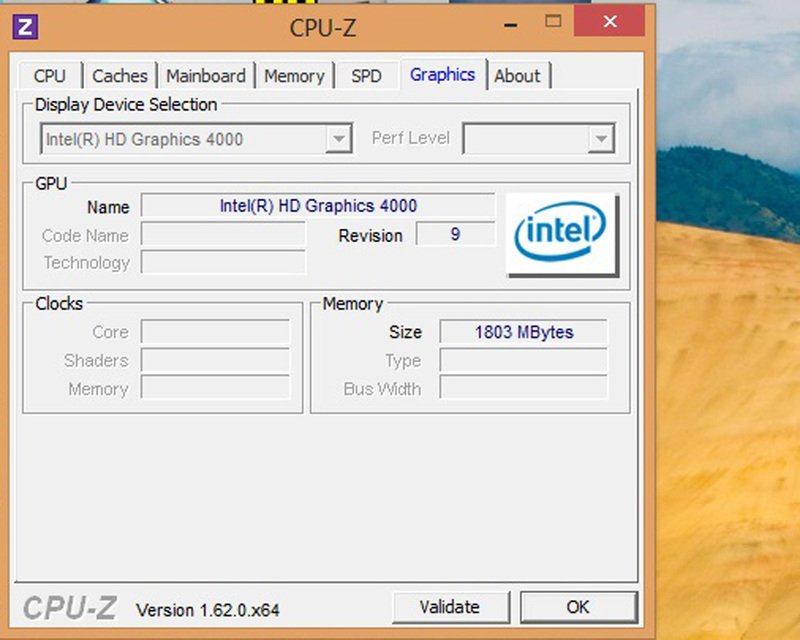 Due to Single Channel mode (RAM), the IGP suffers slightly in performance. 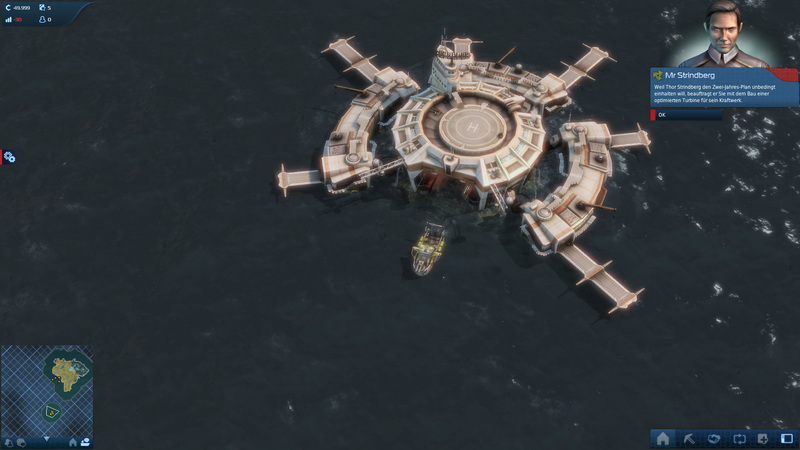 This is shown by the 3DMark 06 benchmark as well (3,898 points). 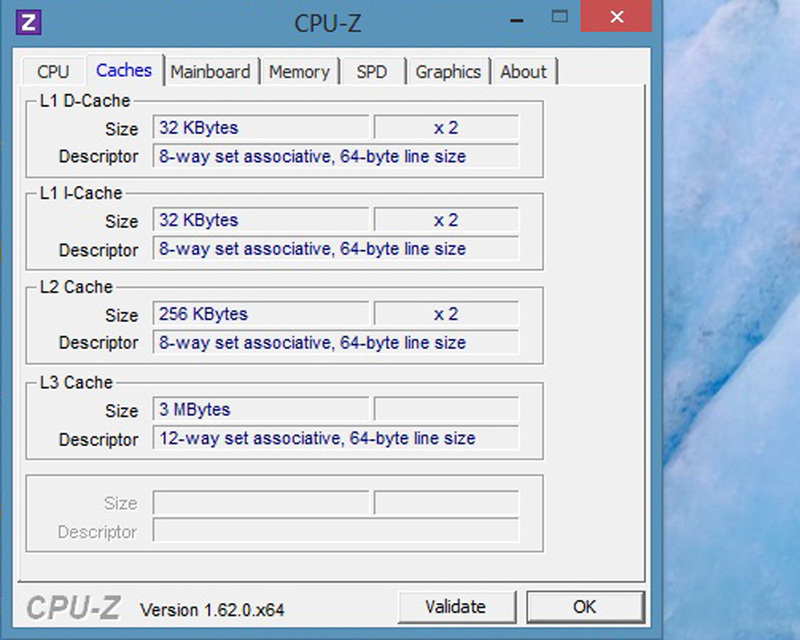 Adding a second RAM module, can activate Dual Channel mode, and increase the performance. In 3DMark 11, the test model scored 575 points and in 3DMark Vantage it got 2,623 points. 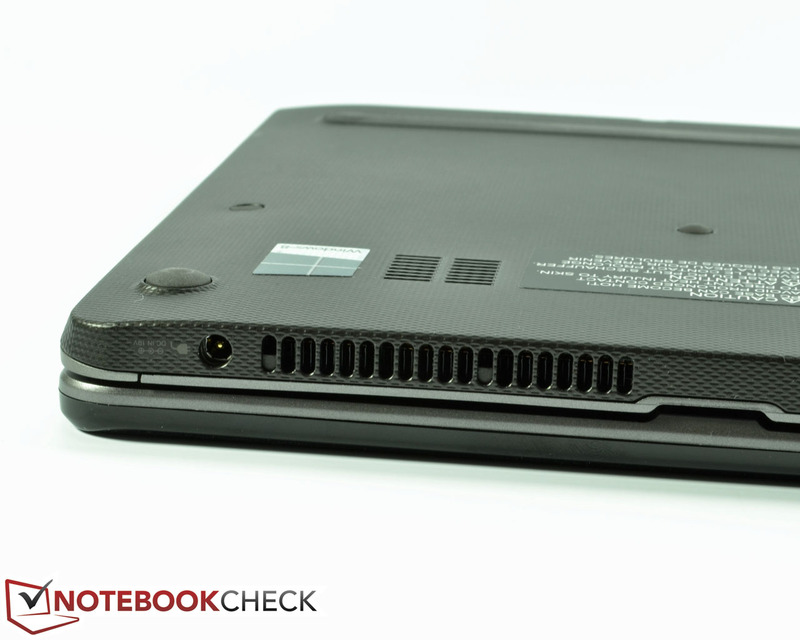 This places the U920t-100 at the same level as Ultrabooks like the Asus Zenbook Prime UX31A. The Sony Vaio Duo 11 can boast of a slightly higher score. After the stress test and on battery, full performance was available on the Toshiba. Of course, the Satellite U920t-100 is not gaming notebook, but less demanding games can be run on the Intel HD Graphics 4000. 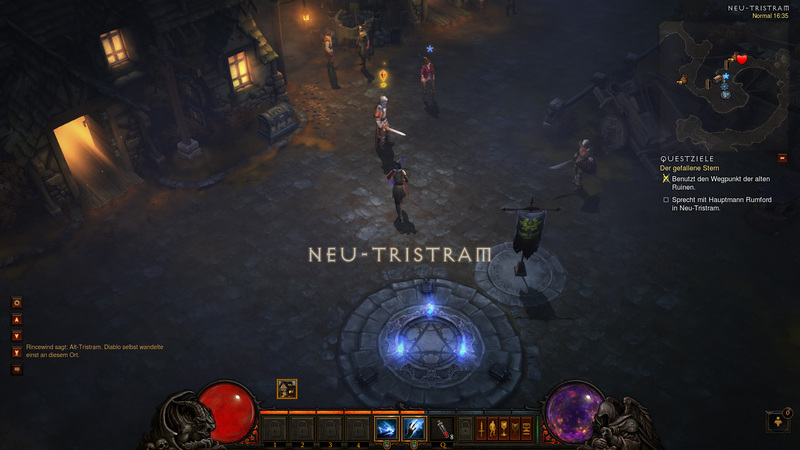 We ran a few games to check the performance of the IGP: Anno 2070, FIFA 13 and Diablo 3. Except for FIFA 13 (33.9 FPS at high settings - the game does not require high performance), the other two games required lower settings and resolution to run at fluid frame rates above 30 fps. The IGP is well-suited for the occasional round of gaming. The Toshiba Satellite U920t-100 never gets uncomfortably hot. The small fan of the Toshiba Satellite U920t-100 is very conservative in idle mode. At first it does not even run. Thus, the noise emissions range from 29.5 to 32.1 dB (A). As soon as the convertible is under load, the fan turns up and the convertible emits an average of 36.5 dB (A). The maximum noise emission is 44.7 dB (A), which by itself would not have been distracting but the fan in the test model emits high frequency noise which is uncomfortably audible. Toshiba has designed a good cooling system for the Satellite U920t-100 and thus ensures low temperatures. While idle, the surface temperatures stay between 27.4 and 28.1 °C (average/~81.3 and 82.6 °F). In this scenario, the test model reached a maximum temperature of 30.7 °C (~87.3 °F). At full load, the Satellite U920t-100 heats up to 47.1 °C (116.8 °F) in certain spots (measured at the ventilation opening). However, the average temperatures range from 29.3 °C (~84.7 °F at the top) to 34 °C (93.2 °F at the bottom). Considering the significant system performance, we believe these to be relatively cool temperatures. Subjectively, the test model never got too hot to handle. That means the user can always comfortably hold the device or place his/her hands on the hand-rest regions. 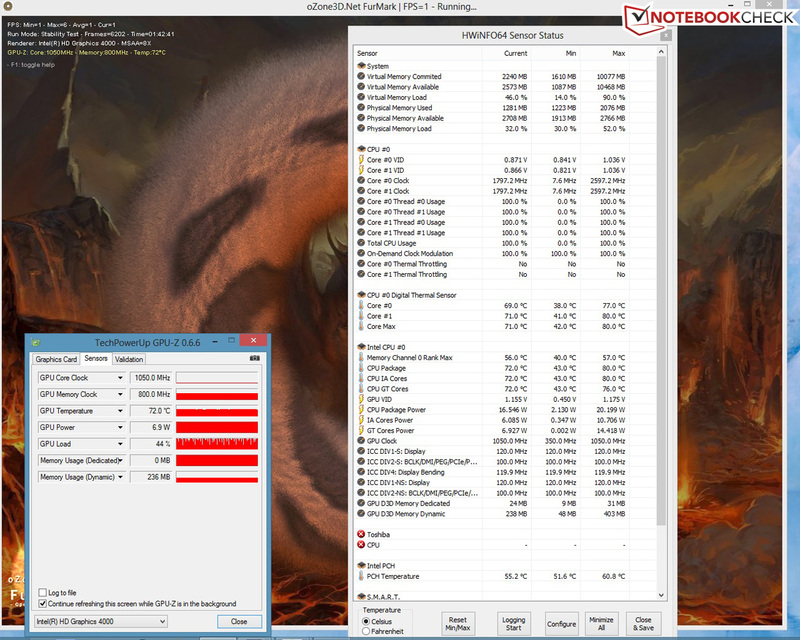 The analysis of the stress test (full load on CPU and GPU - Prime95 and FurMark benchmarks) reveals no throttling even after more than an hour of testing. The CPU can heat up to 80 °C (176 °F) and never goes below its base clock speed of 1.7 GHz. The graphics card heats to a maximum of 74 °C (165.2 °F) and operates constantly at 1,050 MHz (core) and 800 MHz (memory). This result is confirmed by a 3DMark 06 run right after the stress test, as the results are identical to those of the benchmark before the stress test. (+) The average temperature for the upper side under maximal load is 29.3 °C / 85 F, compared to the average of 30.3 °C / 87 F for the devices in the class Convertible. 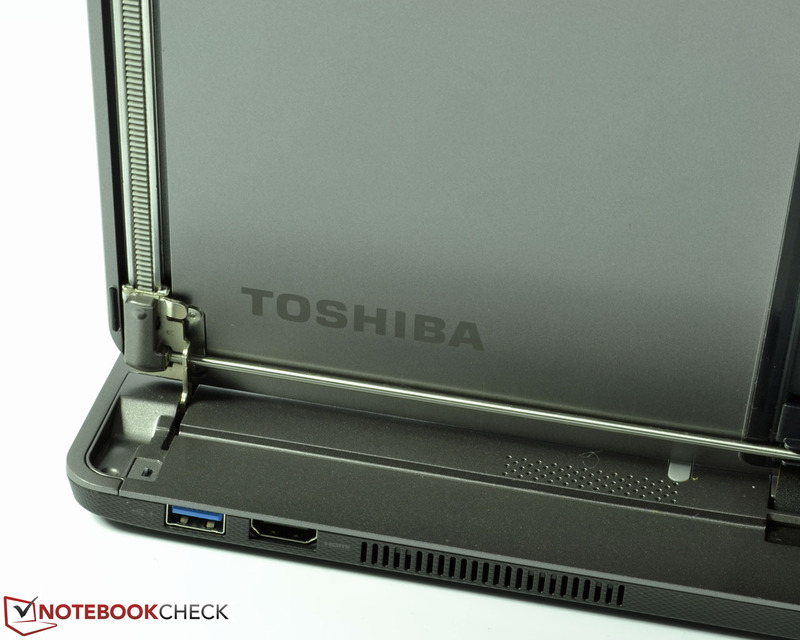 The power consumption of the Toshiba Satellite U920t-100 is conservative, thanks to the power-saving components. The idle consumption oscillates between 5.3 and 9.3 W. At load, the test model consumes up to 31.7 W and an average of 28 W. This means that the compact 40 W power adapter is well dimensioned. The standby consumption of 0.2 W is typical for this class. In comparison to similarly equipped Ultrabooks, like the Asus Zenbook Prime UX31A, the power consumption lies in the expected region. In fact, the Sony Vaio Duo 11 consumes much more, but offers a brighter display. 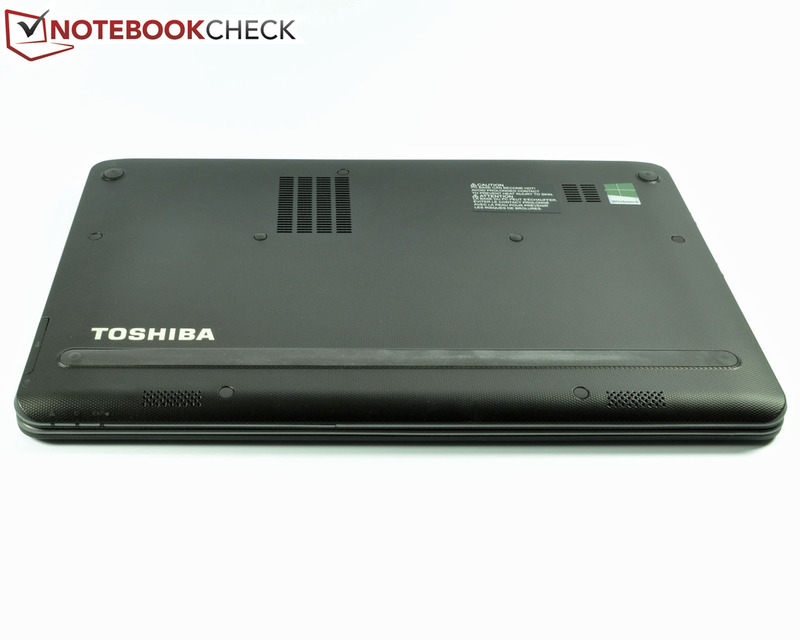 Due to the low power consumption, the Toshiba Satellite U920t-100 has great battery life. 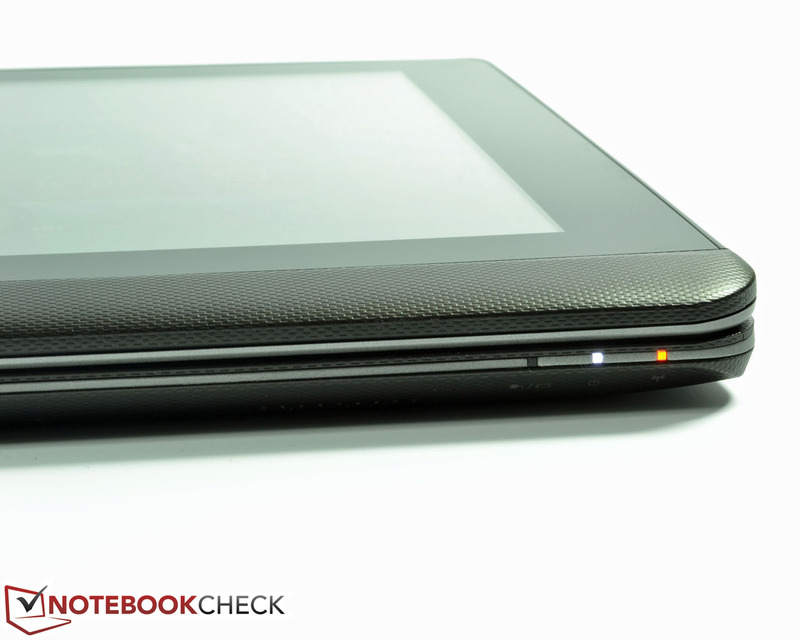 The Reader’s test (Battery Eater tool) runs with minimum brightness, wireless modules off and "Power Saver" mode on. The test model lasts a good 6 hours and 22 minutes in this test. This means that the Toshiba U920t-100 can exceed 4 hours of runtime under light loads. The minimum battery life of 1 hour and 28 minutes is measured at load with the Battery Eater Classic test (max brightness, wireless modules on and "High Performance" mode). We measure a practical 3 hours and 10 minutes in the WLAN test (a browser script loads a mix of websites - "Balanced" energy profile). Movie playback in "Power Saver" mode with maximum brightness depletes the battery within 2 hours and 47 minutes. One or two movies should not be a problem for the 38 Wh battery (3,400 mAh). In comparison to the Sony Vaio Duo 11, our Toshiba test model is a bit worse, mainly due to the stronger 37 Wh battery (4,960 mAh) of the Sony. The Dell XPS 12 offers a lot more thanks to its powerful battery. 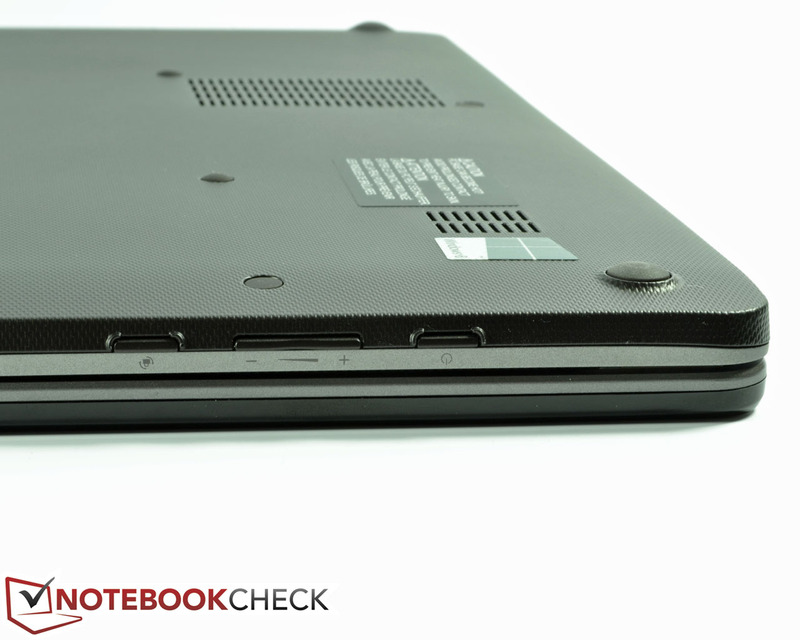 All-in-all, most Ultrabooks with similar configuration, like the Lenovo IdeaPad Yoga, perform at a similar level to our test model. 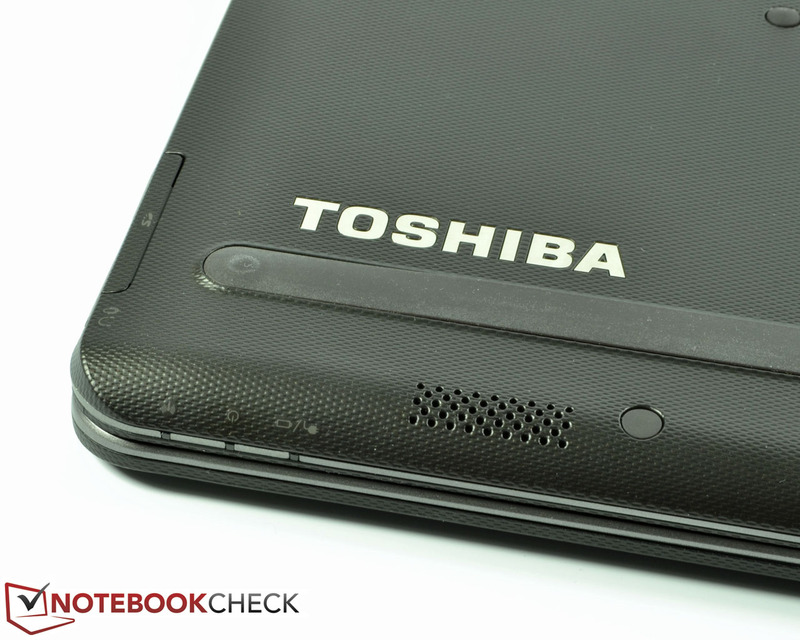 Toshiba could have made the Satellite U920t-100 a convertible for the competition to fear. The nice system performance, great temperature management and precise touchscreen are all advocates for this. The battery life and connectivity are also acceptable for this class. The clean, sturdy workmanship and the reliable slide mechanism deserve special praise. Unfortunately, due to certain flaws, Toshiba failed to achieve this status for its newest convertible. The reflective display is far too dark: 126 cd/m² on battery will limit the mobility significantly. On the other hand, the good black value, crisp contrast and high viewing angles are nice pros. The weak hinges let the display wobble when the laptop is moved, which leads to distracting reflections on the glass surface. Another con is the small touchpad and keyboard, which require getting used to. So can we recommend the purchase of this convertible? Yes and no. 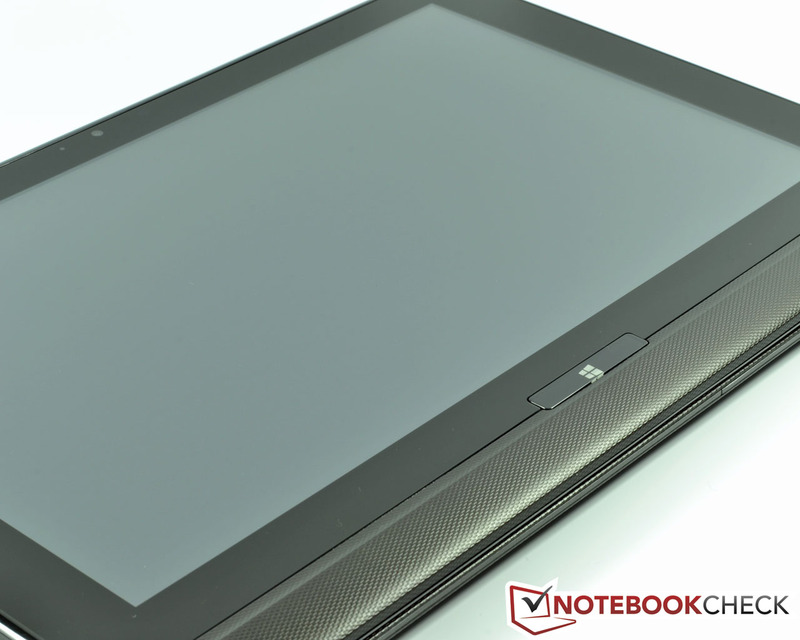 If you can live with the above-mentioned flaws and are willing to pay 1,100 Euros (~$1473), then you will find the Toshiba Satellite U920t-100 to be a multi-faceted mix of a notebook and a tablet, which suffers mainly due to its dark display. Toshiba adds to its Satellite portfolio with a convertible. The small bulge in the base unit offers sufficient space in tablet mode for the main camera. ...side effect: brilliant color depiction. The front edge houses status LEDs and an opening for the speakers. A ventilation opening is placed alongside the power outlet. The exhaust is placed on the back right next to the HDMI interface. The rubber strip on the bottom of the Satellite U920t-100 keeps the model stable. The controls on the left side work well. The slide design requires a lot of space in the base of the model. The keyboard caption is clearly legible. When needed, the keyboard backlight kicks in. ...makes opening the laptop easier. The 45 W power adapter supplies sufficient energy for the conservative convertible. 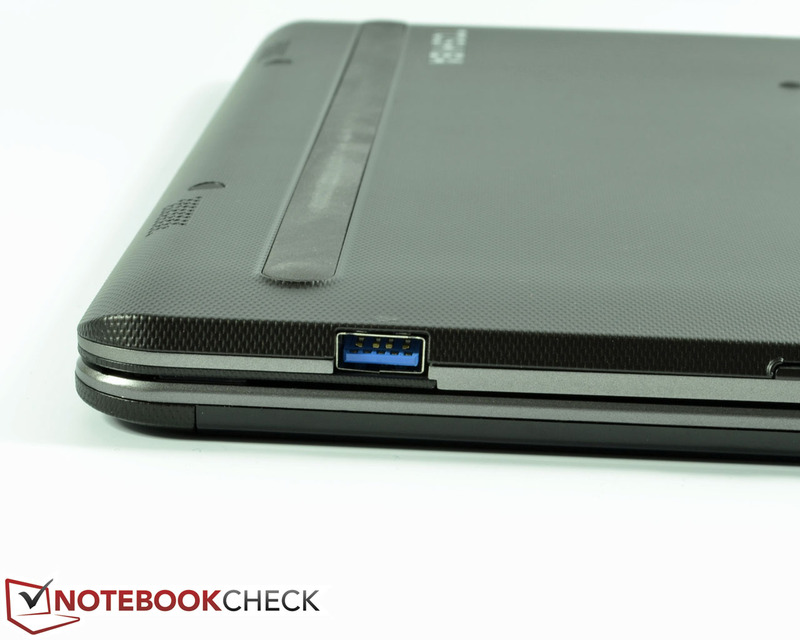 The fast and easy switch from notebook to tablet and back. A brighter display, especially on battery. The convertible class: Dell XPS 12, Sony Vaio Duo 11, Lenovo IdeaPad Yoga 13 and Asus Taichi 21. The upcoming Microsoft Surface with Windows 8 Pro will also belong to this class. Models, which use the Intel Atom CPUs, like the Samsung ATIV Smart PC XE500T1C, the Acer Iconia W510P or the HP Envy x2 are also included in this revived category.